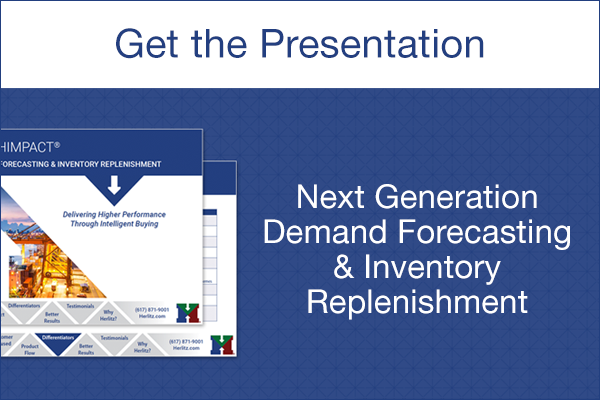 The Herlitz name has been associated with demand forecasting and inventory replenishment planning since the advent of business application software. From the first custom systems of the 1960’s running on IBM mainframes through today’s 9th generation, HIMPACT, the goal of each system has been consistent— create higher value. Each system leverages current business knowledge and the technology base to provide innovative new methods and techniques to help our customers lower their inventory and better serve their customers. From IBM mainframe systems through today’s HIMPACT, each Herlitz system has been designed to help our customers make stronger economic buying decisions, optimize their inventory and customer service, and improve bottom-line performance. Herlitz forward-looking, advanced designs have delivered many key innovative firsts in supply chain software. 1962 IBM introduces Wholesale IMPACT, the first computerized software solution for forecasting and replenishment buying in the wholesale industries. 1964 Anders Herlitz implements Wholesale IMPACT with 50 users in Scandinavia. 1965 Anders is promoted to head of Chain and Wholesale Marketing for IBM Europe. 1968 Anders moves to IBM World Trade HQ, to lead Distribution Industry Development, world-wide. 1969 The first Consumer Goods System – COGS, with initial design by Anders Herlitz is released. 1974 INFOREM is released by IBM, co-designed by Anders Herlitz. Anders take up residence at the IBM Research lab in Rochester, MN. 1975 IBM releases INVEN/3 designed by Anders. The first complete (turn-key) software package using Scientific Inventory Management. The first system supporting forward buy functionality. 1978 The first purchasing system with online screens, INVEN /34 is released. Designed and developed by Anders Herlitz. 1980 Anders leaves IBM to form the E3 Corporation. E3 releases E3/INVEN for DC replenishment. 1982 E3 adds the first functional support for Diverter Buying from third parties to E3/INVEN. 1991 E3 introduces E3TRIM, the first affordable DC replenishment software for mid-size and larger companies. Designed and developed for the IBM mid-range by Carl and Anders Herlitz. 1992 E3SLIM for Store Replenishment is released. E3SLIM & E3TRIM comprise the first multi-echelon replenishment solution for mid-size and larger companies. 1995 E3CRISP is released, the first application software supporting VMI, Vendor Managed Inventory. 1996 Anders Herlitz is honored by Ernst & Young as Entrepreneur of the Year. 2000 E3 Corporation has over 800 customers worldwide. Business offices are in 12 countries on 3 continents. 2001 E3 Corporation becomes part of JDA Software Group, Inc. Carl and Anders Herlitz join JDA in executive roles. 2009 Carl Herlitz forms Herlitz IM in Cambridge, MA. Carl & Anders begin the design and development of HIMPACT. 2012 HIMPACT completes 2 years of Beta testing. General release is announced April 2012.